(From left) Phoenix Gold Golf and Country Club General Manager Nathawat Askornchat, Kanyalak Preedasuttijit, Phoenix Gold Golf and Country Club President Chanya Swangchitr, and Danthai Boonmer. It is always a proud moment when a golf club can boast that it is sending a player to the Open Golf Championship in the United Kingdom. To be able to do so for both the men’s and the women’s championship in the same year is beyond the means of the majority of golf clubs. Phoenix Gold Golf and Country Club will be one of the few golf establishments anywhere in the world that in 2018 will see two of its members gracing the courses of both Carnoustie in Scotland and Royal Lytham and St Annes in North West England, for the men’s and women’s Open tournaments. The victory of Kanyalak Preedasuttijit in the Ladies European Thailand Championship won her entry to the Open at Royal Lytham and St Annes in Lancashire, and she will start her journey by competing in the ASI Ladies Scotland Open at Gullane Golf Club near Edinburgh. She will then join fellow Thais Ariya Jutanagurn, Moriya Juntanagurn, and Atthaya Thititkul, to compete in her first “major” championship. Meanwhile Danthai Boonma has won a place at Carnoustie courtesy of finishing in 4th place in the Singapore Open. He will be part of a Thai contingent of himself, Kiradech Apibarnrat and Jazz Jaynewatananond, and in a field that will also be graced by the likes of Rory Mcllroy, Tiger Woods and Jordan Spieth it is likely to be an experience that he will never forget. 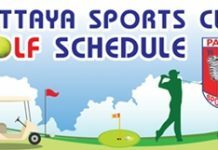 This current season has already been a busy year for Phoenix with both the Ladies European Thailand Championship and the Men’s Asian Tour’s Queens Cup holding events on the Pattya course. With the Royal Cup also due to take place later this month, there is no doubt that hosting these prestigious events is starting to pay dividends, as reflected by the performances of these two young stars who are “Open bound”. Both Kanyalak and Danthai have been honing their skills at Phoenix for several years, and have been able to use the outstanding facilities to put them into the position where both of them are now competing in the world’s premier golf competitions. They will need all of this experience in order to master the challenges that both of these testing British links golf courses will set them. However whatever the outcome of the events that will follow, the 2018 season will be one that will live long in the memories of these gifted young local players.